Tag line: "The legend had it coming... "
In my formative years, I spent a good deal of time watching the movies of Mel Brooks. I loved every single film he directed, from The Producers to History of the World, Part 1 and everything in between, movies that, no matter how often I saw them, never lost their ability to make me laugh. Then, in the late ‘80s, things started to change. Most of the cutting edge material that made Brooks’ early pictures so memorable slowly faded away, replaced by a more juvenile brand of comedy that put the focus squarely on slapstick and broad humor. I noticed this shift in style in 1987’s Spaceballs, a very funny movie that I enjoyed, but which sometimes aimed low, going for the obvious joke more often than Brooks ever had before. This trend continued in 1992, when the writer / director made Life Stinks, a comedy / romance that I absolutely detested. All at once, I found myself wondering if Mel Brooks had lost his edge. So it was with great trepidation that I approached 1993’s Robin Hood: Men in Tights, Brooks’ take on the legend of Robin Hood. Having missed the movie during its theatrical run, I rented the video from my local Blockbuster the day it was released, and sure enough, my worst fears were confirmed. Robin Hood: Men in Tights felt like "Mel Brooks lite", with jokes and situations that, more often than not, fell flat on their face. Full disclosure: I stopped the tape a half hour in, hopped into my car, and returned it to Blockbuster with the intention of never watching it again. Still, as much as I disliked what I saw, I always felt a slight tinge of regret that I never finished the movie. So, today, I finally set things right, and to my surprise, Robin Hood: Men in Tights is funnier than I thought it would be. I didn’t love it, but I did like it. While crusading in the Holy Land, Robin of Loxley (Cary Elwes), aka Robin Hood, is captured by the enemy and placed in a Jerusalem prison. With the help of fellow inmate Asneeze (Isaac Hayes), Robin escapes and swims back to England, where he’s reunited with his blind servant Blinkin (Mark Blankfield). Unfortunately for Robin, he returned home just in time to see Loxley castle being repossessed by the bank for failure to pay back taxes. Vowing to regain his family’s belongings, Robin, along with his new friends Ah-Choo (Dave Chappelle), Little John (Eric Allan Kramer), and Will Scarlet O’Hara (Matthew Porretta), faces off against the tyrannical Sheriff of Rottingham (Roger Rees), a faithful servant of Prince John’s (Richard Lewis). It’s during this time that Robin first meets Marian (Amy Yasbeck), a member of the king’s court, with whom he falls instantly in love. But is romance truly in the cards, or will Robin and his merry men be captured by the Sheriff and thrown in jail? I still had problems with the opening moments of Robin Hood Men in Tights; aside from a rather dated rap sequence, Brooks throws in a brief scene spoofing the Home Alone movies that goes nowhere. 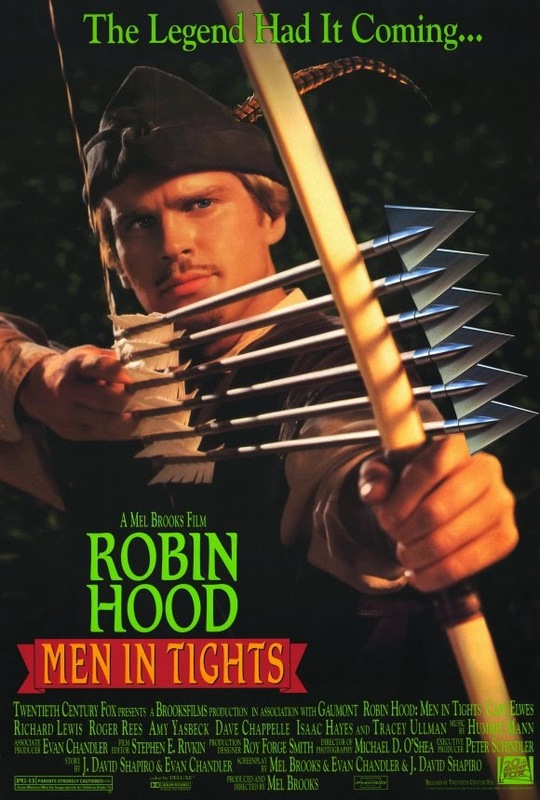 On the plus side, Cary Elwes, so good as the swashbuckling hero in The Princess Bride, makes for a perfect Robin Hood, and many of the film’s musical numbers are well executed, including "Men in Tights", a tune written by Brooks himself. And while the humor does occasionally come across as juvenile (during an archery competition, Robin fires an arrow that defies the laws of both physics and gravity), there’s plenty here for adults to enjoy as well (Brooks’ cameo as Rabbi Tuckman is outshined only by Dom DeLuise's, who, in his brief appearance as Don Giovanni, does a Marlon Brando impression that’s positively hilarious). In the end, I was glad I got to finish Robin Hood: Men on Tights, a movie that, despite its flaws, gave me a few good laughs. But nothing…. Nothing… can get me to watch Dracula: Dead and Loving it. That’s where I draw the line! "But nothing…. Nothing… can get me to watch Dracula: Dead and Loving it. That’s where I draw the line!" I remember Dracula providing quite a few laughs when I was an impressionable 10 year old. It's probably telling, though, that it was excluded from the Mel Brook's box set.